Today, Amazon announced a new feature for its Kindle e-reader called Library Lending, which will enable users to borrow e-books from more than 11,000 libraries in the U.S. The feature will launch later this year, and be available for all Kindle generations. For Kindle users, this will open a trove of free e-books to borrow on-the-go. For publishing as a whole, it marks yet another sign that in an industry of paper and hardcovers–even those stored in the basements of old, dusty institutions like libraries–the transition to the digital age is all but inevitable. How are libraries going to cope with this transition? According to a recent report by Library Journal, libraries across the U.S. are gearing up for this transition by licensing e-books just as they would purchase print copies for their collections. The survey of 781 US libraries found that 72% of public libraries offer e-books, with more their 1,500 on average in their digital circulations. Of the other 28% that do not offer e-books, roughly a third plan to make them available in the coming year. What’s more, when asked why they’re supporting e-books, 64% libraries cited patron request, and 77% cited projected usage. Publishers, however, have not been so thrilled by this trend of public e-book lending. Major publishers like Simon & Schuster and Macmillan have yet to make their e-book collections available to libraries. Other publishers are also hesitant about e-book lending, worrying such a feature could cut into sales from one of the industry’s fastest growing areas. HarperCollins, for example, will require libraries to repurchase e-book licenses after they’re loaned out 26 times. While many might wonder why we need physical libraries to carry digital books, libraries on the whole recognize benefits of e-books, according to the report: e-books do not suffer damage, don’t need to be replaced, cannot be lost, and can be accessed or served to even the most remote of users. Amazon Kindle director Jay Marine also sees benefits, pointing out that unlike physical books, e-books enable customers to make notes and highlights on their borrowed editions without hurting the original copy. So perhaps there is life for libraries post-Kindle. At least that’s what Library Journal hopes. “As interest in and a preference for e-books grows in the culture at large, libraries need to follow suit,” concluded the report, which found that e-book circulation in U.S. libraries is expected to increase by 36% in the near year. 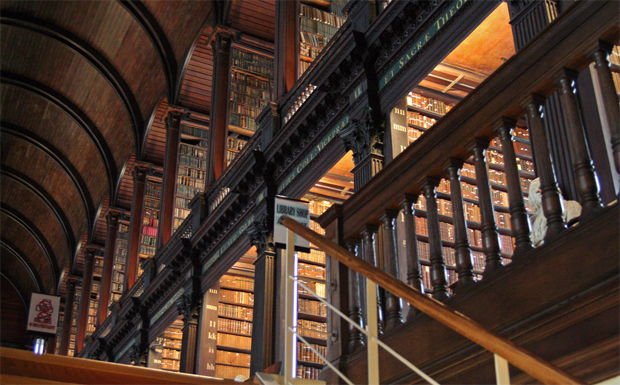 Read More: Google’s Digital Library Failed–Can Academics Succeed?